Plus, get a free living trust! Spare your family from the hassle and expense of probate court as they carry out your wishes. 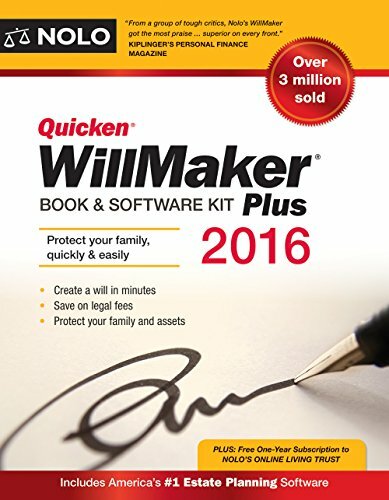 Quicken WillMaker Plus 2016 gives you free access to Nolo's Online Living Trust. Health Care Power of Attorney. Permit a loved one to make important medical decisions for you Living Will. Specify whether you want your life prolonged through artificial means in certain circumstances and set out your wishes about specific medical treatments and procedures. Organize your estate so that your survivors don't have to. Use these documents to give them information about everything from bank accounts to the names of people you'd like contacted in the event of your illness or death.